We're now going to switch from studying arches to studying trusses. We've reached the wide Russian River, which is crossed by several long truss bridges. For some reason, people in San Francisco love the Russian River and treat it like the ocean, sunning themselves along its banks. The Wohler Road Bridge (20C0155) includes three long (230 ft) truss spans and concrete approach spans, but it's only 16.7 ft wide. Drivers have to patiently watch and wait for traffic to clear before trying to get across before the next car arrives. They say the bridge only carries 500 vehicles a day, but that must be on weekdays. When we arrived on a Sunday it seemed like there was non-stop traffic on this bridge. The Wohler Road Bridge was built in 1921 by the American Bridge Company of New York City. According to Historic Bridges each Parker through truss span is composed of 10 pin-connected panels. The bridge is eligible for the National Register of Historic Records but it's also supposed to get a seismic retrofit whenever funds become available. The fragile laced members seem unsuited for much shaking. I just returned from looking at undamaged bridges after Sunday's M6.0 South Napa Earthquake. 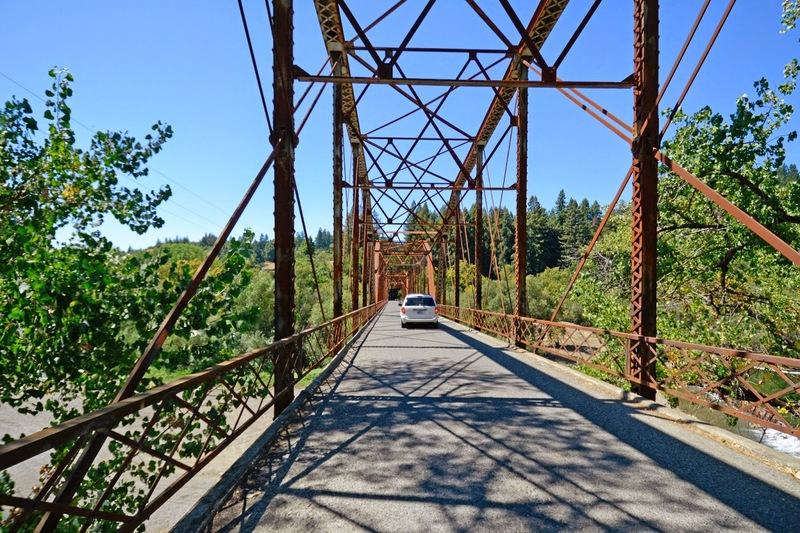 It was fortunate that there were no bridges that looked like the Wohler Bridge near Napa. Sonoma County, California Bridges: Wohler Road Bridge across the Russian River (1) by Mark Yashinsky is licensed under a Creative Commons Attribution-NonCommercial-NoDerivatives 4.0 International License.